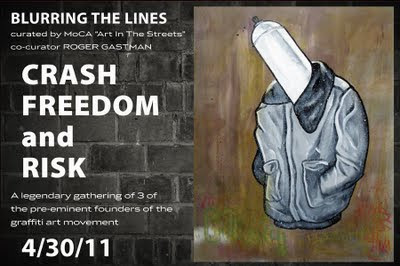 It seems that 40,000 sq feet of street art isnt enough for Roger Gastman, co-curator of the MOCA "Art in the Streets" exhibition currently open in Los Angeles. He's spread its wings and curated an overspill show in Culver City in a more modest space. The public reception for “Blurring the Lines” will take place on Saturday, April 30 from 7 to 10pm, and the show will be on view until May 18, 2011. Read more about the artists below - information from Corey Helford Gallery's press release. 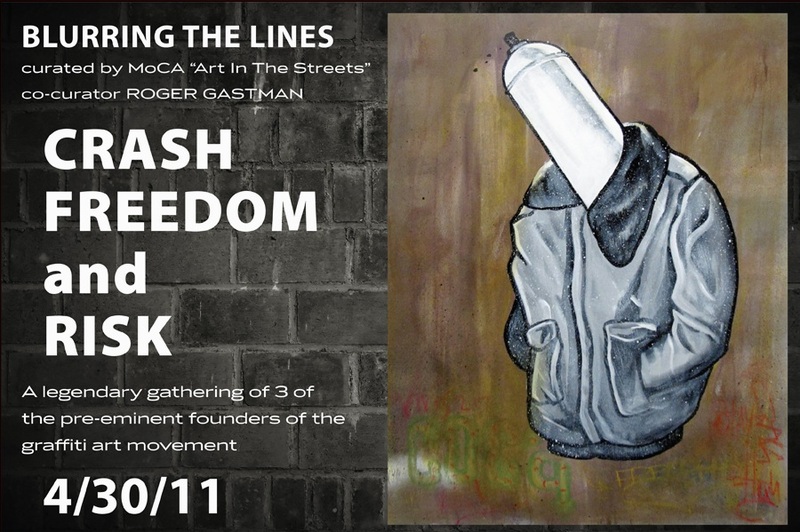 "Renowned New York graffiti artists CRASH and FREEDOM will take over the main floor with recent works inspired by their iconic imagery that was shown along alongside art luminaries Jean-Michel Basquiat, FUTURA, and Keith Haring during the 80s. A master at subway art, CRASH was also one in a handful of New York writers who painted murals on the streets during the early 80s while exhibiting at prestigious galleries worldwide. At the same time, FREEDOM moved into a larger space in Manhattan, an abandoned two mile stretch of tunnel designed by Robert Moses that would become the legendary Freedom Tunnel, launching a sixteen-year run of world-famous paintings and drawings. Born in 1960, Chris Pape began painting trains as a teenager in New York, and in 1979, he adopted his worldfamous moniker FREEDOM. Pape began exhibiting in galleries in the early 80s showing with CRASH, Jean Michel Basquiat, FUTURA and others. In 1989, with the emergence of the “Mole People”, he chose to abandon his gallery career and focus on painting and drawing the homeless known as the Freedom Tunnel series. In 1996 the tunnel was closed off and the artist painted his final work titled “Buy American”. Considered by many to be the leading archivist of the New York subway graffiti movement, Pape reemerged as an author and filmmaker, continuing to paint commissions based on the eclectic works in the Freedom Tunnel for collectors worldwide. Growing up in the Bronx, John Matos began his career at the early age of 13. He was first noticed through his murals on subway cars and dilapidated buildings. As he got older, he transferred his art from the street to canvases and has exhibited his work in museums worldwide. In 1996 Matos painted a signature Stratocaster for musician Eric Clapton and gave it to the artist as a gift. Clapton used this guitar throughout his 2001 tour. In total Matos has created five guitars for Clapton and was commissioned by Fender Musical Instruments for 50 guitars he titled the “Crashocasters.” Today Matos is not only recognized as a fine artist, he is also regarded as a pioneer of the graffiti movement. Matos’ work is included in the collections of Museum of Modern Art, New York, Stedelijk Museum, Amsterdam, Brooklyn Museum of Art, Brooklyn as well as private collections worldwide. 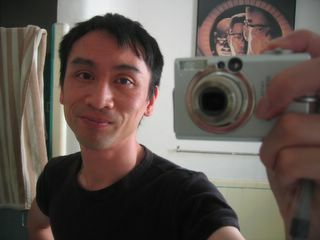 For more information about the artist, please visit crashone.com. In a career spanning 29 years, RISK has impacted the evolution of graffiti as an art form in Los Angeles and worldwide. RISK gained major notoriety for his unique style and pushed the limits of graffiti further than any writer in L.A. had before: He was one of the first writers in Southern California to paint freight trains, and he pioneered writing on “heavens,” or freeway overpasses. At the peak of his career he took graffiti from the streets and into the gallery with the launch of the Third Rail series of art shows, and later parlayed the name into the first authentic line of graffiti inspired clothing. RISK has continued to work on numerous Hollywood projects for movie and music video sets, including the film Bill and Ted’s Excellent Adventure and videos for The Red Hot Chili Peppers, Ice Cube, Bad Religion and Michael Jackson. Today, RISK is still involved with graffiti, surrounding himself with writers and supporting them in their art, and exhibiting at galleries and museums worldwide. For more information about the artist, please visit riskrock.com.